I was sent this book from Revell Reads. My ratings and reviews will be my own personal opinions and are in no way influenced by publishers or authors who may have sent me books to review. "It's Elvis Week in Memphis, and homicide Detective Rachel Sloan isn't sure her day could get any stranger when aging Elvis impersonator Vic Vegas asks to see her. But when he produces a photo of her murdered mother with four Elvis impersonators--one of whom had also been murdered soon after the photo was taken--she's forced to reevaluate. Is there some connection between the two unsolved cases? And could the recent break-in at Vic's home be tied to his obsession with finding his friend's killer? When yet another person in the photo is murdered, Rachel suddenly has her hands full investigating three cases. Lieutenant Boone Callahan offers his help, but their checkered romantic past threatens to get in the way. Can they solve the cases before the murderer makes Rachel victim number four?" 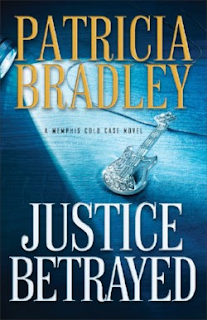 Just Betrayed is the third book in the Memphis Cold Case series but can be read as a standalone. I love watching television shows around cold cases, so I thought that this would a fun read. I am not normally a huge fan of detective reads, but I enjoyed this one. I think I enjoyed it since the detective, Rachel Sloan, was actually a part of the action/mystery/murders. She was not just on the sidelines investigating, but was connected to everything going on as well. This started off intense, and names the killer. That prologue was really amazing! However; it did slow down a little for me. There was so much information repeated as Sloan was starting to get involved with the murders. It was a little slow moving until toward the end. I did like that even though you knew who the killer was, you really do not know until it is revealed (once you read this, this will make sense).